Erica caterviflora is a magnificent erica that was thought to have become extinct by the early 1990s, but the author rediscovered it in 2006 while exploring cave entrances along the moist, shaded cliffs on Table Mountain. The rediscovery of E. caterviflora has been a most rewarding experience and poses many questions about its ecology as a fire refuge species. 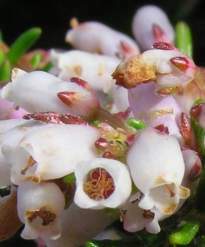 Erica caterviflora has a very limited distribution. 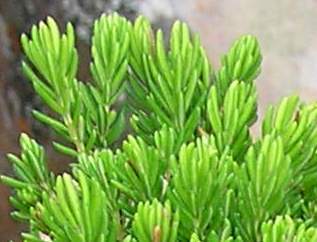 It is an unusual erica as it assumes different growth forms depending upon where it grows. It may grow into a small tree, as a lithophyte (cliff-loving), or it can be stunted and bonsai-like. Large specimens have trunks up to about 150 mm in diameter, grow up to 5 m tall and produce wiry branches that spread about 4 m wide. The majority of specimens, however, form large shrubs between 2 and 4 m tall. Quite a few plants were found growing out of crevices in the cliff face. These cliff-loving plants (lithophytes) grow happily in this cool, shaded, moist habitat although they are much smaller and stunted. A few plants were seen growing on boulders that had fallen from the cliff. These plants were severely stunted with thick, gnarled trunks and a growth habit much like bonsai plants. Erica caterviflora is an erect, well-branched, woody plant with greyish brown, flaky bark. The leaves are dark green and densely packed around the stems and branches, producing a soft textural effect. It produces short, tubular or urn-shaped flowers that range from pink to pale pink or white. The flowers are numerous and densely packed in congested clusters at the ends of branches. The flowers of this species are covered with fine hairs, but there is another far less common variety, E. caterviflora var. glabrata, which is hairless (glabrous). Flowers are produced from January to March and are honey-scented. Numerous small seeds are produced in small lobed capsules from February to May. Erica caterviflora is a very slow growing, long-lived species. It grows in seldom-burnt microhabitats that allow it to grow undisturbed for long periods of time. It is very difficult to guess age, but mature specimens have been estimated to be well over 100 years old. Erica caterviflora is a narrow endemic with a very limited distribution on cool, moist, shaded, upper-middle, south-facing slopes of Table Mountain. It was believed to have become extinct in the early 1990s when the last known plant was trampled. The specialized niche habitat where this plant grows protects it from fire. The main threat to this species is from trampling, as the lush vegetation in its habitat is highly susceptible to too frequent traffic. The best way to protect the species is to not advertise its locality and to have experts monitor the population every few years. 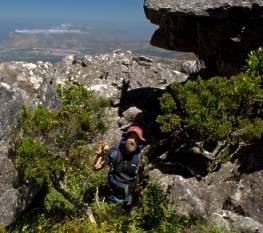 Erica caterviflora grows at the base of or on moist south-facing cliffs on Table Mountain. Five separate, but closely situated populations have been found amounting to a total of approximately 270 plants. This plant survives in cool, windy areas where it is often blanketed by southeaster clouds during the hot summer months. The soils are rocky, well-drained and nutrient poor. It normally grows up against or near cliffs where it gets plenty of moisture and very little direct sunlight. At best, specimens receive about 2 hours direct sunlight each day in midsummer and some none at all. Specimens growing in sunnier positions away from cliffs were stunted, yellow and showing signs of stress. Average temperatures where it grows probably range from about 4 -15 ºC with upper temperatures rarely exceeding 20 ºC. It experiences winter rainfall with an annual average of ± 1800 mm. Plants grown at Kirstenbosch from an old collection have been difficult to grow and maintain as good specimens. Fresh cuttings taken from vigorously growing plants in habitat have proved much easier to grow. Plants need to be grown in containers and kept in a cool place under shade. This erica owes its name to the Latin word caterva, which means a crowd or group, referring to the crowded arrangement of its flowers at the ends of branches. It is apparent that this is an extremely slow-growing species that needs to escape many successive fires in order to reach maturity. An interesting discovery was made while doing field assessments of the population size of this species. We found that this species is able to regenerate from seed in mature vegetation without the intervention of fire. 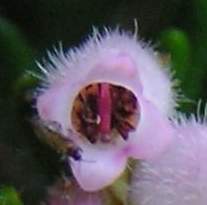 The theory that no fire in fynbos is detrimental to the long-term survival of species does not apply to Erica caterviflora. The flowers emit a strong honey scent, but no bees were seen visiting the plants. There were, however, hundreds of cave flies attending the flowers and they are probably responsible for pollination. It appears to produce relatively little seed despite the numerous flowers. Seeds germinate in any nook and cranny within the cool shaded habitat and very few plants are found away from cliffs in direct sunlight. The species appears to be able to survive for long periods growing in niche habitats where there is little soil. It is a reseeder and not a resprouter. Field study has also resulted in the resolution of an 100-year-old mystery. This is the question of Erica caterviflora Salisb. var. glabrata Benth. There is a collection in the herbarium by Harry Bolus of a form of E. caterviflora without hairy flowers, and without specific locality information. Current botanists had not seen this form until the rediscovery of the population. We now know that the non-hairy form, var. glabrata, occurs with the hairy form. Only 10 plants of this form have been found. This species has been grown as a potplant at the Kirstenbosch Nursery and is also grown by one other specialist grower. Fresh semi-hardwood tip or heel cuttings are used, but it is not easy to root. Cuttings are rooted in multi-trays on heated benches under mist spray. The best time to root erica cuttings is late summer/autumn or spring. Cuttings are rooted in bark and polystyrene, using a rooting hormone for semi-hardwood cuttings. We have not sown seeds of this species. 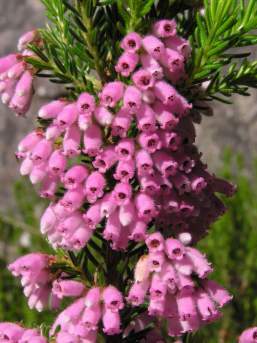 Erica caterviflora will not thrive in gardens and should only be grown as a pot plant by garden enthusiasts skilled in growing difficult plants. It is very slow growing and only produces short spurts of growth at a time. Feed with an organic liquid or pellet fertilizer. Potting soil should be acidic, sandy and well drained. Mix a combination of equal parts composted pine bark or pine needles and river sand. A little loam (20%) may also be added. Pests do not present a major problem, but watch out for aphids on new growth and mealy bug. Adamson, R. S. & Salter, T. M. 1950. Flora of the Cape Peninsula. Juta, Cape Town and Johannesburg. Interim Red Data list: www.sanbi.org. Oliver, I. & E.G.H. 2000. Field guide to the Ericas of the Cape Peninsula. Protea Atlas Project, National Botanical Institute, Cape Town. Schumann, D. (Dolf) & Kirsten, G. (Gerard). 1992. Ericas of South Africa. Fernwood Press, Vlaeberg, Cape Town.